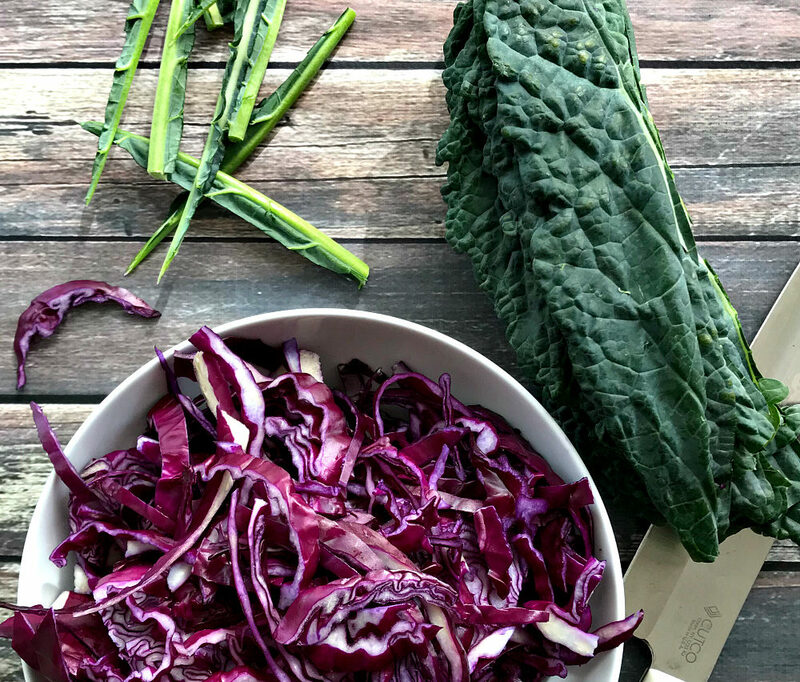 My warm red cabbage coleslaw is an easy side dish that you’ll want to make on repeat. It’s loaded with flavor, texture, and totally addicting! My obsession with coleslaw is real, y’all. I’ll take it any way I can get it, but the first time I had a warm “slaw”, it changed my life. I just loved the crunchy, warm textures in contrast to the cool, creamy sauce – and I’ve been making every variation I can think of since. Give my warm red cabbage coleslaw and try and thank me later! The dressing is what makes it! Think warm bacon dressing – but better. Cook the bacon until it’s crispy (or not – for those of you who like it chewy), and use the fat left in the pan to wilt the veggies and flavor the dish. The entire recipe can be done in about 15 minutes. You’re not fully cooking the cabbage and kale. This is a coleslaw, so a few minutes of cooking is all that’s required. 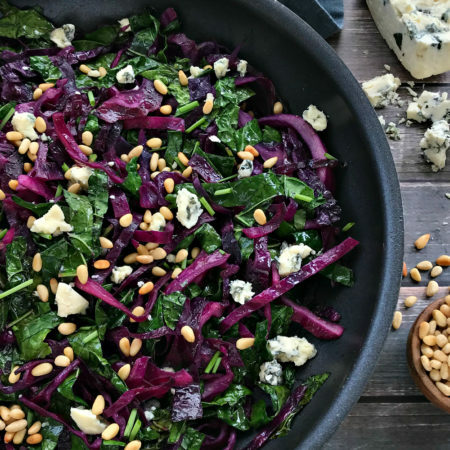 While the bacon is cooking, chop the veggies, give them a quick sauté, add the dressing, pine nuts, and blue cheese, and serve it up! We love it alongside grilled steak, chicken, or on its own. 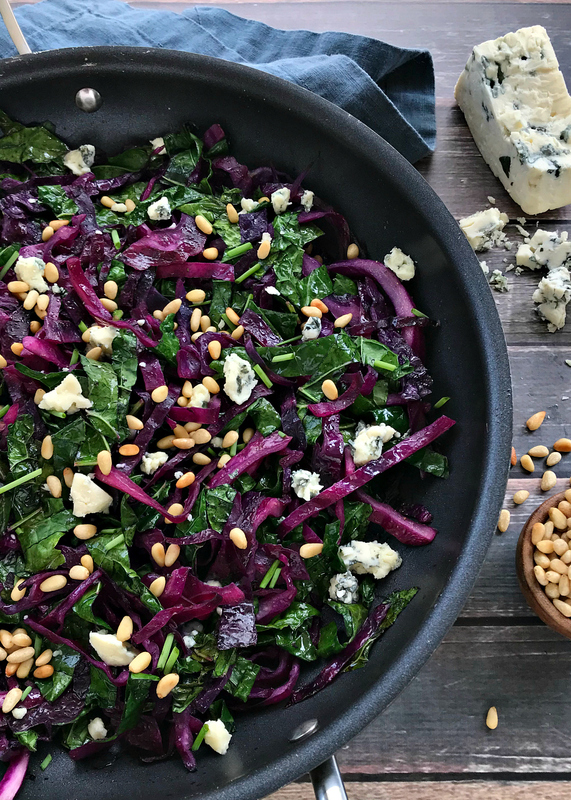 There’s plenty of protein from the bacon, blue cheese, and pine nuts to make a quick and tasty low-carb meal! If you’re following a keto lifestyle, you’ll love this dish. One of the things I missed the most when I was eating super low carb was texture. You won’t miss that a bit with this dish – promise! I prefer to use red (purple) cabbage for both color and texture, but you could also use green or Napa cabbage. Keep in mind that they will wilt much quicker, so the cooking time will be even less. 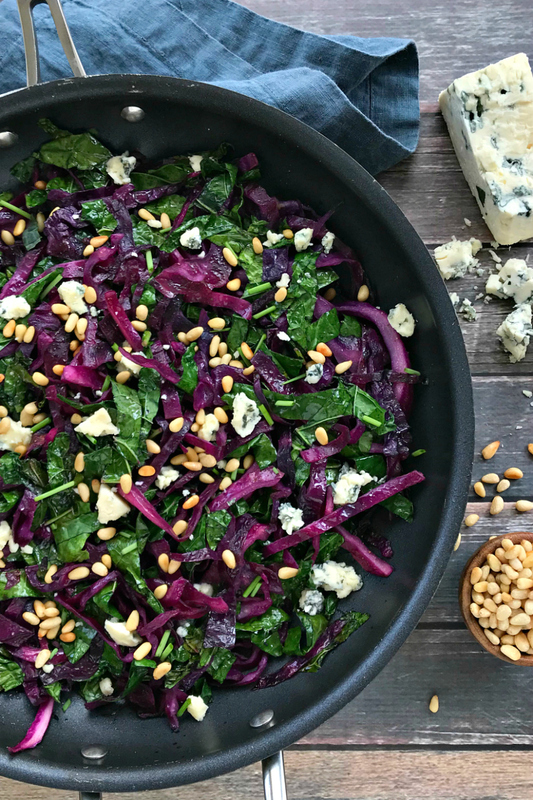 The blue cheese adds a deliciously creamy, pungent layer of flavor to the slaw, but feel free to leave it out if you’re not a fan. Goat cheese would be a great substitution! Pine nuts add a buttery, rich flavor that I can’t get enough of. I can’t stress enough how important it is to take a few extra minutes to toast them. It intensifies their flavor and makes them even more delicious! Serve this with my easy 5-ingredient beer bread! I use apple cider vinegar, but balsamic would also work if you want it a little sweeter. To prep the kale, cut out the middle rib, slice the leaves in half, stack them up, and cut into 1/2″ wide strips. My warm red cabbage coleslaw is an easy side dish that you'll want to make on repeat. It's loaded with flavor, texture, and totally addicting! In a small bowl, whisk together one tablespoon of the olive oil, the vinegar, salt, and pepper. Set aside. Add the remaining olive oil to a large non-stick skillet over medium heat. Add the cabbage and cook it for approximately 4-5 minutes. When the cabbage is wilted but still crunchy, add the kale and stir for about 1 minute. Remove the pan from the heat and drizzle on the dressing. Stir to combine and taste. Adjust the salt and pepper to taste. Top with the blue cheese, pine nuts, and chives just before serving. To toast the pine nuts, add them a small, dry pan over medium-high heat. Cook for 2-3 minutes or until fragrant and lightly brown - stir constantly. Do not walk away from this. They can burn in seconds. As soon as they're done, get them out of the pan! To prep the kale, cut out the middle rib, slice the leaves in half, stack them up, and cut into ½" wide strips. If you don't like blue cheese, goat cheese would be a great substitution! I like a lot of vinegar, so I used two tablespoons. You might want to start with one, taste, and adjust accordingly. 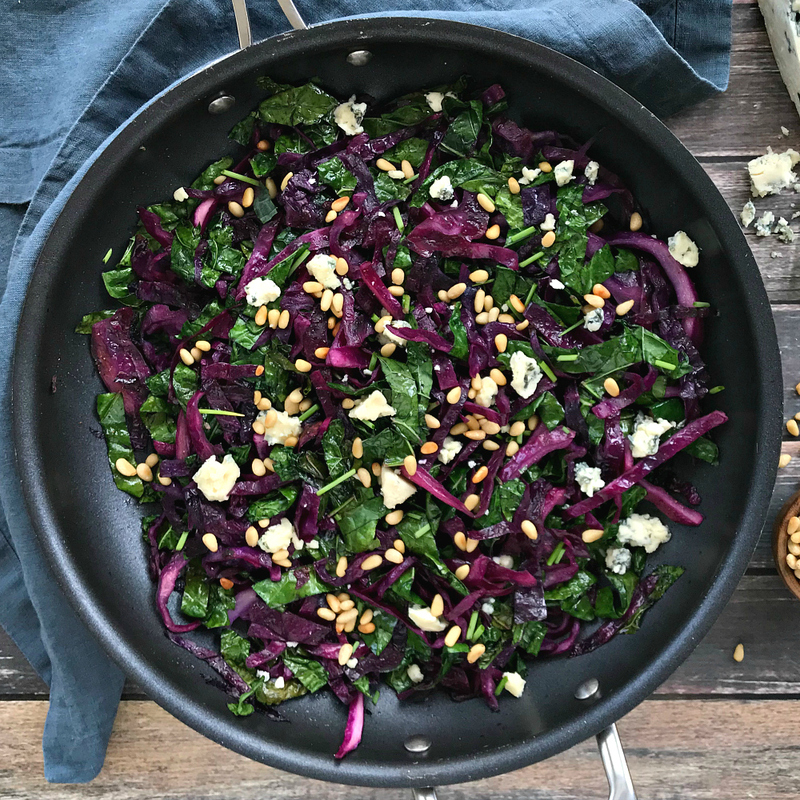 For a nicer presentation, sprinkle the blue cheese and pine nuts over the top so they don't turn a weird color from the purple cabbage. A mom, wife, foodie, and lover of pasta, coffee, animals, and all things Disney! I’ve been happily married for 20 years and am a proud momma to two grown kids! Follow My Eating & Cooking Adventures On Instagram! Copyright ©2019, Saving Every Day. All Rights Reserved.